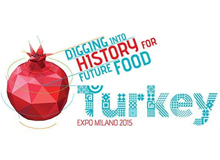 Turkey opens the gates of its EXPO 2015 pavilion in Italy, showcasing Turkish food, art and architecture. Classical Turkish homes, glass art and famous cuisine are just some of the attractions awaiting visitors at the country’s world fair exhibition at the Milan EXPO 2015, which was unveiled on Monday. Turkey is running the fifth-largest display in the Italian city out of more than 140 exhibiting nations. The 2015 event is centered on environmental issues. Entitled “Feeding the Planet, Energy for Life,” Turkey is promoting its pavilion with theme of “Digging into history for future food,” and adopting a pomegranate as its icon – known as a fertility symbol in the country. Monday’s opening ceremony hosted top officials and prominent figures from the business and finance world including Deputy Economy Minister Adnan Yildirim, Turkey’s Expo 2015 High Commissioner Tarik Sonmez and Turkey’s Milan High Consul-General Aylin Sekizkok. Turkey, one of 147 countries participating in EXPO 2015, has “much to share and offer to the world in terms of food, nutrition and energy,” said Yildirim in his keynote speech. The Turkish pavilion opened its gates to visitors with activities showcasing a traditional Turkish home and sadirvan fountains – one of the most distinguished architectural symbols of Turkish-Islamic culture. Glass art works – nightingale eyes (Cesm-i Bulbul) – and cultural relics from the Seljuk Empire will also be in the Turkish pavilion to see. Turkey will host Expo 2016 – its first such event – in the southern region of Antalya next year. It is expected to welcome more than 100 countries, 30 international organizations and millions of visitors.